We assume that you’ve already installed and activated plugin. Now you’re ready to add stories and setup feeds. 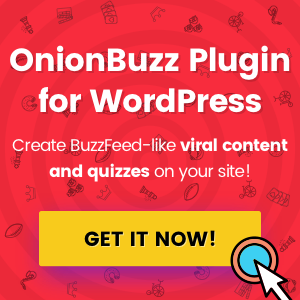 Stories — any kind of viral content (including quizzes) created with OnionBuzz plugin. Feeds — custom OnionBuzz taxonomies. Feeds are simply categories for your stories. Find shortcode in the list of stories on Stories tab. Copy and paste to any blog post or page. Head over Feeds/Main feed tab. This is the feed where all the stories fall. Change feed name and slug if necessary. Click eye button to get full URL. Additionally, you can display links on all of your feeds with widget (see below). How to Get URL of Native Plugin Story? What if you don’t want to use shortcodes and display feeds, but still need to get URL to the story? You can get URL to the OnionBuzz story the same way as you get it for feeds. While editing your story, click eye button. The story will be opened in a new browser tab. Copy URL from the browser’s address bar and that’s it! You can create multiple feeds (categories) for your stories. While editing your story attach it to one or multiple feeds. While editing feed itself you can change slug for better SEO. Click eye button to open feed page in new tab. Check address bar of your browser to get feed’s URL if you need it. Go to Appearance/Widgets in WordPress admin sidebar. Add OnionBuzz Categories widget to pages or posts where you want to display custom categories (feeds) created with OnionBuzz plugin. Go to Appearance/Menus in WordPress admin sidebar. Check that desired menu is selected. Select OnionBuzz feeds or stories that you want to add to menu. And hit Add to menu button. Don’t forget to Save menu.